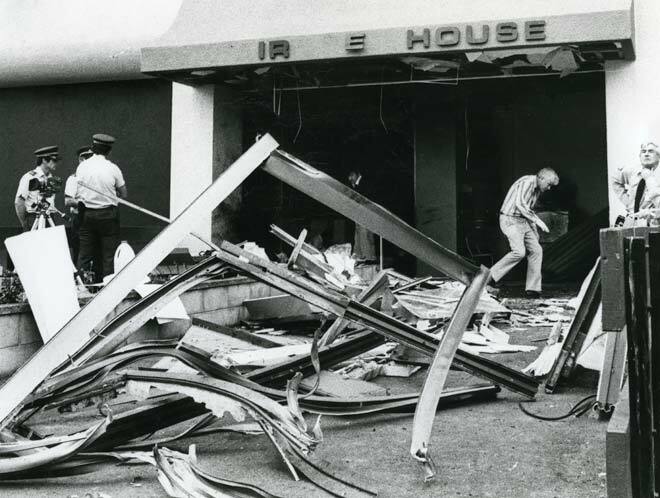 This photograph shows damage to the Wanganui Computer Centre after a bomb attack on 18 November 1982. The Wanganui Computer Centre, opened in 1976, held the National Law Enforcement Data Base. The computer's ability to record the personal information of citizens was seen as potentially dangerous by civil libertarians. These concerns grew with the polarisation of public opinion during the Springbok rugby tour of 1981 and subsequent protests against the policies of the government of Prime Minister Robert Muldoon. Neil Roberts, a 22-year-old anarchist who had long been involved in the protest movement, blew himself up in a bomb attack on the computer centre. The action appears to have been as much a symbolic blow against what Roberts saw as an authoritarian state, as it was an attempt to destroy the computer centre.